Looking at 9/11 and 11/12/01 memorials. The sun, or as my friend Mitch Waxman, who writes at newtownpentacle.com, refers to it, the “burning thermonuclear eye of God,” was beating down mercilessly, or as merciless as 80 degrees can get. Unlike Rockaway peninsula residents, I’m not a beach devotee; like Nixon, I keep my shirt and shoes on when walking in the sand, though I skip the jacket and tie. One day this past summer, I made my way across the Gil Hodges-Marine Parkway Bridge and along the Riis Park beachfront, and thence along Rockaway Beach Boulevard. Before calling it a day, I headed toward the transit hub at Rockaway Park. 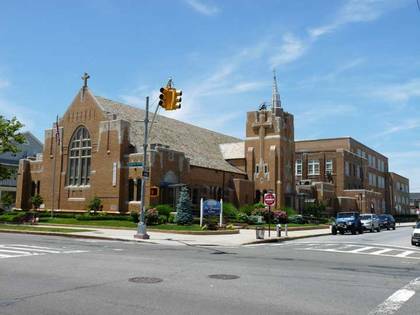 Saint Francis De Sales Church, at Rockaway Beach Blvd. and Beach 129th St., has been in existence since the early-20th century and has seen the effects from the destruction of the World Trade Center, viewed clearly from the Rockaways; the crash of American Airlines Flight 587 on November 12th, 2001; and Hurricane Sandy, October 29-30, 2012, which devastated the peninsula. The church has played a major role in the succor and encouragement of the victims of these tragedies as well as a focal point of community gatherings and relief operations. Directly across the street, catercorner from the church, is a joint memorial to 9/11 and 11/12/01. The remembrance is a plaque mounted on a stone, both situated near eye-level on a brick wall. Also atop the wall is a statue of Jesus, welcoming all. The dedication on the plaque sets the November 12, 2001 accident in the neighborhood and refers to passengers and flight crew of Flight 587. It names the five people on the ground, parishioners of St. Francis de Sales, who died in the crash: Helen and Thomas Concannon, Kathleen and Christopher Lawler and Franco Pomponio. Only weeks before, the parish lost 12 members of its family on 9/11. Sponsored by the parish, the memorial was dedicated in 2003. 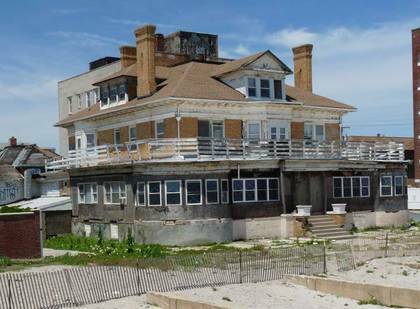 Appearing out of the still-rebuilding beachfront like a ghost was the old Hotel Del Mar, at what was Ocean Promenade and Beach 125th St., one of many seaside hotels built along the water in the early-20th century as Rockaway Playland was built and residential developments began to march west in Rockaway Park, Belle Harbor and Neponsit. The Del Mar, which opened in 1930, occupied the seaside mansion built in 1912 by Edward and Josephine “Hickie” Wren on Triton Ave., an early name for Ocean Promenade. An above-ground basement and a wraparound porch that accepted the breeze no matter which direction provided adequate to excellent cooling on hotter days before the days of air conditioning. A small rooftop observatory was provided to view the stars, planets and moon in the era before blaring and glaring sodium lighting rendered them nearly invisible. Edward Wren, born in Ireland, was a successful department store entrepreneur, known in the era as a “merchant prince.” He and his family sought a seaside dwelling in the early-20th century as he’d contracted Bright’s disease, a disorder of the kidneys, and fresh air was a major component of therapy then. After Edward Wren died in 1917, the home was sold to new investors who turned it into the Del Mar, which for several decades was among the most popular resorts on the peninsula, hosting myriad weddings and bar mitzvahs. The Del Mar’s final incarnation was as the Chai Home for Adults. 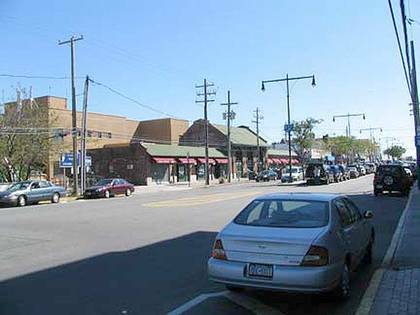 Beach 116th St. is the main street of Rockaway Park, extending two short blocks from Beach Channel Dr. on the north to Ocean Promenade on the south. It’s the western terminus of the lengthy IND A train, which reaches all the way north to Inwood in Manhattan. Rockaway Park sprung up around the terminal and stations of the New York, Woodhaven and Rockaway Railroad, which opened in 1880 and later became part of the Long Island Rail Road. The line became a part of the NYC subway system in 1956. 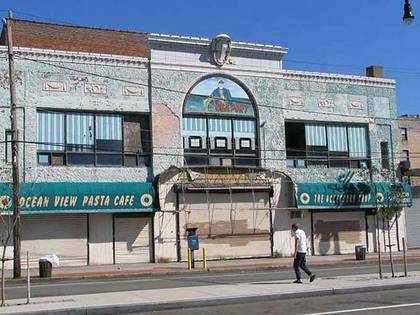 Rockaway Park has been known in the past as the “Irish Riviera” or “Irish Town.” A cluster of bars and bungalows that served as a summer refuge for Irish New Yorkers until it was razed 50 years ago to make way for high-rise apartments. Hordes of working-class Irish—immigrants and their children—streamed out of buses and trains and found an escape from the hot tenements of New York. They spent weekends in bungalows and rooming houses and passed the hot days on the beach. 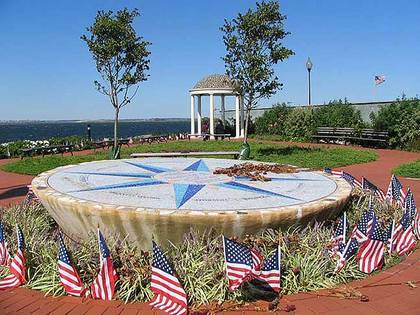 Rockaway Park’s 9/11 memorial is on the north side of Beach Channel Dr. where it meets Beach 116th St. and Newport Ave. 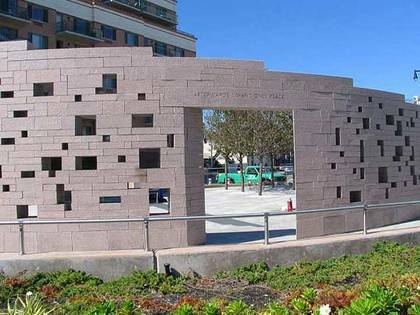 It commemorates the 70 residents of Rockaway Park and the 343 firefighters killed when they responded to the burning and collapse of the Twin Towers. It’s highlighted by a pavilion with a stained-glass roof designed by artist Patrick Clark. The “343″ memorial sculpture was designed and begun by Russian sculptor Isabella Slobodov, and completed by Clark. The 17,000 square foot parcel faces Jamaica Bay, Broad Channel and beyond it, the towers of Manhattan. Landscaping for the project was done by Lynden Miller and Nadia Murphy. Of all the accounts of the firefighters killed on 9/11, I found Capt. Timothy Stackpole’s tragedy especially poignant. He was battling an inferno in East New York, Brooklyn on June 5, 1998 when a floor collapsed, killing two fellow firemen and leaving him with serious burns. He fully recuperated from his injuries and returned to active duty, only to perish at the World Trade Center, leaving behind a wife and five children. Stackpole was a graduate of my alma mater, St. Francis College in Brooklyn. 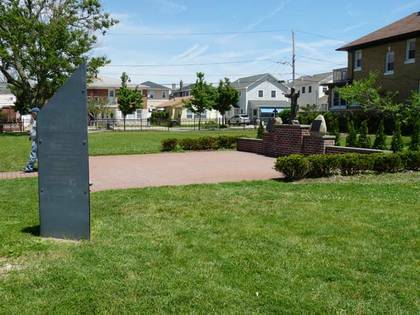 At the waterfront at the south end of Beach 116th is the Rockaway Park memorial to Flight 587. Leaving from nearby JFK Airport and bound for the Dominican Republic, the plane crashed into the Rockaway peninsula in Belle Harbor shortly after takeoff on November 12, 2001. Studies are inconclusive but point to, perhaps, crew overcompensation for air turbulence caused by proximity to the plane that took off from JFK immediately before Flight 587. 260 passengers and crew perished as well as five persons on the ground. A few doors down, the Park Theater was located on Beach 116th just off the boardwalk. According to cinematreasures.org, the Park operated from about 1929 to 1961. It was an RKO house for a while in the early to mid-1940s. By 1947 Movietone News had replaced RKO Pathe News. In 1947 the inner lobby was redone in red plush and the new “sliding seat” was installed so patrons could shift rearward to allow someone to pass without standing up from their seat.